The beginning of the Ten Year War. This is the game that not only changed the rivalry, but also changed Michigan football forever. This was certainly not the most hyped game in the Ten Year War or the closest, but it was probably the most important because of what it created and changed. Without this game, there might have never been a Ten Year War, Michigan football's dominance in the decades following, or the great legacy of Bo Schembechler. To say Michigan had been struggling before the 1969 season would really be an understatement, especially if one is looking at the team's performance against Ohio State. Over the last nine games against OSU, Michigan had won just twice. The Wolverines had also only beaten Buckeye teams coached by Woody Hayes a total of six times in eighteen seasons. That gave Hayes a 67% winning percentage against Michigan. Very impressive for such a long tenure. The rivalry in the preceding years had been fun for Buckeye fans, but had been horrible for Michigan fans. Michigan was not only failing to compete in "The Game", but they also had largely lost relevance in the Big Ten and national spotlight. Long gone were the days of Fielding Yost, when Michigan would win five Big Ten Championships in six years. Instead, before the 1969 season, Michigan had won just one Big Ten Championship since 1950. Over the course of 18 seasons, Michigan hoisted the trophy just once and during one streak had not hoisted the trophy in thirteen consecutive seasons. That's the longest such stretch in Michigan football history, even to this day. Ohio State, on the other hand, had been rolling under coach Woody Hayes. He had won the Buckeyes four conference championships since taking over and had only had a losing season twice in his eighteen years at the helm. However, what was probably the most impressive was that he was coming off a National Championship during the 1968 season, a 10-0 record, and a Rose Bowl victory. One thing to note about the 1968 Buckeye squad was their dominating 50-14 victory of Michigan in Columbus to end the regular season. Near the end of the game, Woody decided to go for a two-point conversion. The actual reason for this coaching decision is debated, but rumors spread that Woody said he went for two because he "couldn't go for three", which served as a major insult for Michigan fans. During the 1969 season before "The Game", the Buckeyes had simply dominated opponents. The Buckeyes were 8-0 and had only allowed one opponent score more than 14 points prior to their match-up with the Wolverines. Michigan also had an impressive 7-2 record before facing the Buckeyes and had improved as the season progressed, but they still entered as major underdogs against the #1 Buckeyes. OSU started the game with the ball after a great return ended up on the 44 yard line. OSU quarterback Rex Kern then took the ball for a solid 25-yard gain. OSU kept moving the ball and eventually ended up with a fourth-and-two from the 11 yard line. Hayes opted to go for it, most likely because his offense was doing so well, but Michigan was able to stuff the Buckeye runners and send them off the field. This was a great stop, but Michigan did nothing with the opportunity and OSU got the ball back at the 27 yard line after a punt return. OSU followed this by scoring a touchdown and making the score 6-0 after a missed extra point. For most opponents of Woody's 1969 team, this would be the end of real competitive play. However, Michigan used a solid kick return and some great catches by All-American tight end Jim Mandich to get back into the game. Garvie Craw was able to get into the endzone and made the score 7-6 in favor of Michigan. 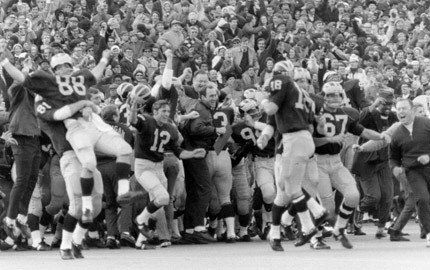 This was the first time OSU had trailed since the 1968 Rose Bowl. OSU was able to march back down the field and score again to take the lead. However, because of a penalty, Woody decided to go for two instead of a field goal, but missed, which gave the Buckeyes a slim 12-7 lead. This would be the last time the Buckeyes scored. After more great play by Mandich, the Wolverines got back into position for Garvie Craw to get back in the endzone and give gave Michigan a 14-12 lead. Michigan quarterback Don Moorhead later made a great fake to put Michigan up by another touchdown at 21-12. Michigan's defense then stepped up and shut down OSU quarterback Rex Kern to get the ball back to Moorhead and Mandich, who came up big in the minutes following. Michigan was able to get into the endzone, but after a penalty voided the touchdown, kicked a field go to lead 24-12. This was the score at halftime and would end up being the final score of the game. Michigan's defense and the outstanding play of Jim Mandich really gave Michigan the ability to beat the undefeated Buckeyes in amazing fashion. This single game could potentially be the most important game in the history of Michigan football. Of course, that statement is debatable, but the implications of this game seem never-ending. As assistant coach and eventual Michigan head football coach Gary Moeller stated about the game, "It just changed everything. It legitimized what we were doing and changed the course of the program". Bo Schembechler's tenure at Michigan changed the dynamic of the entire program and this was the game that really started that movement. Michigan would not only become a threat to Ohio State and Woody Hayes on a yearly basis, but would also become a yearly threat for the Big Ten Championship and a team with national aspirations. After failing to compete with the Buckeyes on a yearly basis and for Big Ten Championships consistently, Schembechler would take a 5-4-1 record against Woody, 13 Big Ten Championships, 10 Rose Bowl appearances, and 17 seasons in which the Wolverines finished ranked #10 or above. Those are the type of numbers that built Michigan from an average Big Ten team to one of the nation's biggest college football programs. The game also had a devastating impact on Buckeyes coach Woody Hayes. He has often referred to his 1969 team as one of his very best and many think that if they would have beaten Michigan, they would have repeated as National Champions in 1969. There's no way to prove this, but with their record, they would have certainly been in the running for the title had they beaten the Wolverines. Another thing to note is that because of the Big Ten's rules in 1969, the Buckeyes did not attend a bowl game. They went from roses to nothing in just one afternoon of football, a pretty big let-down for any team and especially the defending National Champions. The final impact of the 1969 game was the return of "The Game" and the start of the Ten Year War. 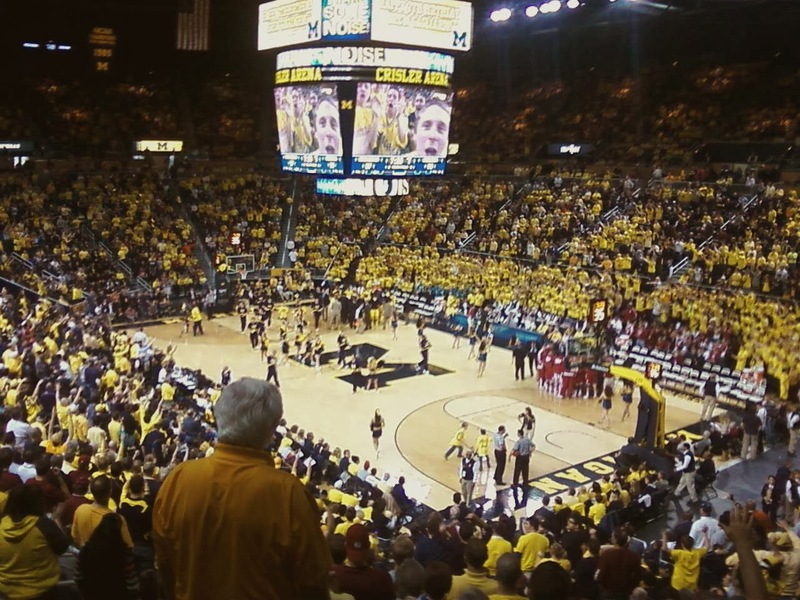 Hayes began plans for the rematch with Michigan almost from the moment his team left Ann Arbor. This would be one of the things that made the 1970 Edition so intense. Without this upset, the importance and emotion expressed in this series would surely have been lessened. Woody seemed to have an almost insane level of anger that developed as the result of his best team losing its opportunity at bigger and better accomplishments. Regardless, the events over the following years would last longer than perhaps even those involved could have predicted.